“The Magnificent Seven” remake is going to be a blast, in one way or another. The first full trailer for the action flick, starring Denzel Washington as the lead cowboy who recruits six other gunslingers to help him fight for justice, features lots of bullets flying through the air, as well as an explosion rocking the army they’re facing in the Western. “I’ve always wanted to blow something up,” Chris Pratt‘s heroic character says in the preview. Antoine Fuqua (“Training Day”) directed the ensemble Western co-starring Ethan Hawke, Vincent D’Onofrio, Byung-Hun Lee, Manuel Garcia-Rulfo and Martin Sensmeier as the rest of the “Seven” warriors facing off against a villain played by Peter Sarsgaard. Sony is releasing “Magnificent Seven,” which the studio co-produced with MGM, into theaters on Sept. 23. As we bask in the glow of new footage for "Rogue One" from Star Wars Celebration Europe, it can be easy to lose track of the big picture. So let's take a step back and rundown the basics of what we know of the standalone flick from director Gareth Edwards. "Rogue One" is the first ever standalone film in the "Star Wars" universe -- with the seven previous live-action movies being part of the numbered saga of episodes, and the animated "Clone Wars" movie kicking off a TV show. These standalone films will all carry the subtitle "A Star Wars Story." It's set just before the events of "Star Wars: Episode IV - A New Hope," and will lead right up to that start of that film. In fact, the movie was inspired by the opening crawl on "A New Hope," which describes rebel spies stealing the Death Star plans during the Rebellion's first major victory against the Empire. It's about a ragtag group of soldiers sympathetic to the Rebel Alliance who are commissioned to steal the plans for the original Death Star. They're led by Jyn Erso (Felicity Jones), pictured. 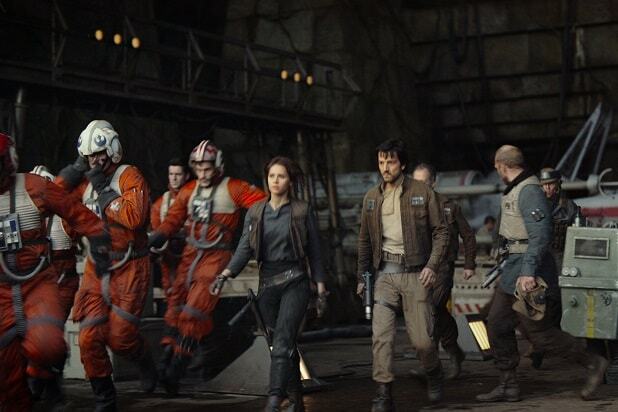 The cast is quite the ensemble, consisting of Felicity Jones, Diego Luna, Forest Whitaker, Ben Mendelsohn, Riz Ahmed, Donnie Yen, Wen Jiang, Mads Mikkelsen and Alan Tudyk. For more on their characters, be sure to check out our who's who gallery. Many of the protagonist characters aren't traditional "Star Wars" hero types, as befits a Dirty Dozen-style band of outlaws. Riz Ahmed's Bodhi Rook is defector from the Empire. Forest Whitaker's Saw Gerrara is a bitter and angry rebel. Wen Jiang's Baze Malbus has a really big gun and loves to shoot it. And Alan Tudyk is playing a mean droid (pictured). There are no Bothan spies in "Rogue One" because they stole the plans to the second Death Star, the one from "Return of the Jedi," not this one. Darth Vader is gonna be in it, and he will once again be voiced by James Earl Jones. We still haven't seen him, as far as we know, in widely available footage, though at Star Wars Celebration Europe, attendees of the "Rogue One" presentation were treated to exclusive footage that did show the Sith Lord. There will be other sights and characters from the original "Star Wars" trilogy -- Rebel leader Mon Mothma, the base at Yavin IV and the inside of the Death Star. And plenty of unfamiliar sights, as well. For one thing, Director Krennic (Ben Mendelsohn) leads a specialized group of stormtroopers known as death troopers. We also get some scenery that's completely different from any we've seen in "Star Wars" on the planet Scarif. Shot in the Maldives. The stormtroopers in the scenes on Scarif are mostly played by members of the Maldives army, none of whom knew anything about "Star Wars." It's more of a regular war movie, with a more gritty and grounded visual style and tone, than the rest of the "Star Wars" movies, which have traditionally had more of an adventure feel. The visual style in particular is completely distinct from the previous "Star Wars" films. The boots-on-the-ground sort of look of his films is one reason Kathleen Kennedy wanted to hire director Gareth Edwards for the job -- he shoots his movies very differently than directors have shot "Star Wars" in the past. The Rebel Alliance has not yet fully formed yet in this movie -- Forest Whitaker's character, Saw Gerrara, leads one of several disparate rebel groups that are coming together to form this alliance. "Rogue One" will also be the first "Star Wars" movie not scored by John Williams, as Alexandre Desplat is composing the music this time out.